Russell and Hill Monroe, WA, personal injury lawyers are here for you. Call us at 1-888-399-0921 and let's start figuring out the best way to get this behind you. If you become hurt as a result of a personal injury accident, either by a motor vehicle, bike, another pedestrian, wrongful death, or another kind of accident, seek counsel from one of our professional personal injury attorneys. We have years of experience in providing service to clients in Oregon and Washington, and we have office locations in Portland, Everett, Spokane, and Vancouver. Contact Russell & Hill, PLLC by completing our free personal injury evaluation form or reach us to schedule a free initial consultation. If you’ve suffered a substantial injury in an accident, it is likely that the hospital bills are becoming overwhelming. This is especially concerning if your injuries are preventing you from working, or requiring additional medical appointments. Our utmost goal is to assist you in obtaining complete and just compensation for all of your personal injuries and losses. This includes medical bills, future healthcare needs, unpaid wages, and the trauma suffered. The personal injury attorneys here at Russell & Hill, PLLC, have provided representation to countless individuals in Monroe, who have been hurt in a personal injury accident. We are dedicated to guiding victims of accidents and their families through these challenging situations. In an instant, a person’s entire life can be severely disrupted— all due to the carelessness of someone else. Our personal injury lawyers develop a tight working relationship with each client in Monroe, carefully assessing the details of the personal injury accident and evaluating each and every one of the client’s’ injuries, expenses, and losses. Our attorneys at Russell & Hill, PLLC pair with personal injury experts as needed to solidify every case. We frequently partner with incident scene reconstructionists to investigate tire skid marks, damage to property, and any additional evidence. We carefully review all the details that may help us understand and effectively illustrate the cause of the accident and identify the responsible party. We integrate medical testimonies from clients’ doctors to help illustrate the exact extent of the injuries. 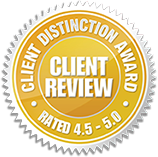 When appropriate, we also work with vocational professionals to understand how the accident has impaired our client’s capability to work, as this information is extremely pertinent to SSDI proceedings. Contingent upon the intentions or carelessness of the culpable party, our client may be eligible to personal injury monetary damages for any and all expenses or losses that have been incurred directly due to the injury through a judgment or a settlement. After our personal injury attorneys have fully concluded a thorough investigation, legally established the responsible party, and evaluated the client’s personal injury monetary damages, losses, and costs, we will make a presentation of the claim and as needed. This includes performing negotiations with the pertinent parties, such as insurance companies, for just and fair compensation. 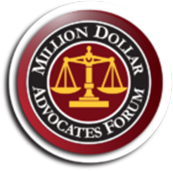 Insurance companies respect our judgment because they are aware that we come prepared for each case in order to be highly successful if the case goes to trial. If a just settlement cannot be reached, we are aggressive, professional trial attorneys who are beyond prepared to make a presentation of our client’s case to a jury. 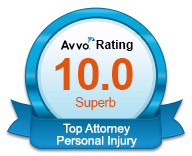 Our attorneys are assertive, committed advocates who allocate all the time and energy required to complete every client’s personal injury case with the utmost success. 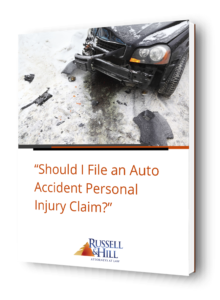 If you or a loved one have been injured in a personal injury accident in the state of Washington or Oregon, contact Russell & Hill, PLLC, personal injury attorneys, by completing our free personal injury evaluation form. Or, reach us at our toll-free number, 888-920-3183, to schedule a free initial consultation.